See also Gunpowder on Wikipedia; gunpowder on Wiktionary; and our 1911 Encyclopædia Britannica disclaimer. GUNPOWDER, an explosive composed of saltpetre, charcoal and sulphur. Very few substances have had a greater effect on civilization than gunpowder. Its employment altered the whole art of war, and its influence gradually and indirectly permeated and affected the whole fabric of society. Its direct effect on the arts of peace was but slight, and had but a limited range, which could not be compared to the modern extended employment of high explosives for blasting in mining and engineering work. It is probably quite incorrect to speak of the discovery of gunpowder. From modern researches it seems more likely and more just to think of it as a thing that has developed, passing through many stages—mainly of improvement, but some undoubtedly retrograde. There really is not sufficient solid evidence on which to pin down its invention to one man. As Lieutenant-Colonel H. W. L. Hime (Gunpowder and Ammunition, 1904) says, the invention of gunpowder was impossible until the properties of nearly pure saltpetre had become known. The honour, however, has been associated with two names in particular, Berthold Schwartz, a German monk, and Friar Roger Bacon. Of the former Oscar Guttmann writes (Monumenta pulveris pyrii, 1904, p. 6): "Berthold Schwartz was generally considered to be the inventor of gunpowder, and only in England has Roger Bacon's claim been upheld, though there are English writers who have pleaded in favour of Schwartz. Most writers are agreed that Schwartz invented the first fire-arms, and as nothing was known of an inventor of gunpowder, it was perhaps considered justifiable to give Schwartz the credit thereof. There is some ambiguity as to when Schwartz lived. The year 1354 is sometimes mentioned as the date of his invention of powder, and this is also to be inferred from an inscription on the monument to him in Freiburg. But considering there can be no doubt as to the manufacture in England of gunpowder and cannon in 1344, that we have authentic information of guns in France in 1338 and in Florence in 1326, and that the Oxford MS. De officiis regnum of 1325 gives an illustration of a gun, Berthold Schwartz must have lived long before 1354 to have been the inventor of gunpowder or guns." In Germany also there were powder-works at Augsburg in 1340, in Spandau in 1344, and Liegnitz in 1348. Roger Bacon, in his De mirabili potestate artis et naturae (1242), makes the most important communication on the history of gunpowder. Reference is made to an explosive mixture as known before his time and employed for "diversion, producing a noise like thunder and flashes like lightning." In one passage Bacon speaks of saltpetre as a violent explosive, but there is no doubt that he knew it was not a self explosive substance, but ony so when mixed with other substances, as appears from the statement in De secretis operibus artis et naturae, printed at Hamburg in 1618, that "from saltpetre and other ingredients we are able to make a fire that shall burn at any distance we please." A great part of his three chapters, 9, 10, 11, long appeared without meaning until the anagrammatic nature of the sentences was realized. The words of this anagram are (chap. 11): "Item ponderis totum 30 sed tamen salis petrae luru vopo vir can utri et sulphuris; et sic facies tonitruum et coruscationem, si scias artificium. Videas tamen utrum loquar aenigmate aut secundum veritatem." Hime, in his chapter on the origin of gunpowder, discusses these chapters at length, and gives, omitting the anagram, the translation: "Let the total weight of the ingredients be 30, however, of saltpetre ... of sulphur; and with such a mixture you will produce a bright flash and a thundering noise, if you know the trick. You may find (by actual experiment) whether I am writing riddles to you or the plain truth." The anagram reads, according to Hime, "salis petrae r(ecipe) vii part(es), v nov(ellae) corul(i), v et sulphuris" (take seven parts of saltpetre, five of young hazel-wood, and five of sulphur). Hime then goes on to show that Bacon was in possession of an explosive which was a considerable advance on mere incendiary compositions. Bacon does not appear to have been aware of the projecting power of gunpowder. He knew that it exploded and that perhaps people might be blown up or frightened by it; more cannot be said. The behaviour of small quantities of any explosive is hardly ever indicative of its behaviour in large quantities and especially when under confinement. Hime is of opinion that Bacon blundered upon gunpowder whilst playing with some incendiary composition such as those mentioned by Marcus Graecus and others, in which he employed his comparitively pure saltpetre instead of crude nitrum. It has been suggested that Bacon derived his knowledge of these fiery mixtures from the MS. Liber ignium, ascribed to Marcus Graecus, in the National Library in Paris (Dutens, Enquiry into Origin of Discoveries attributed to Moderns). Certainly this Marcus Graecus appears to have known of some incendiary composition containing the gunpowder ingredients, but it was not gunpowder. Hime seems to doubt the existence of any such person as Marcus Graecus, as he says: "The Liber ignium was written from first to last in the period of literary forgeries and pseudographs ... and we may reasonably conclude that Marcus Graecus is as unreal as the imaginary Greek original of the tract which bears his name." Albertus Magnus in the De mirabilibus mundi repeats some of the receipts given in Marcus Graecus, and several other writers give receipts for Greek fire, rockets, &c. Dutens gives many passages in his work, above-named, from old authors in support of his view that a composition of the nature of gunpowder was not unknown to the ancients. Hime's elaborate arguments go to show that these compositions could only have been of the incendiary type and not real explosives. His arguments seem to hold good as regards not only the Greeks, but also the Arabs, Hindus and Chinese (see also Fireworks). There seems no doubt that incendiary compositions, some perhaps containing nitre, mostly, however, simply combustible substances as sulphur, naphtha, resins, &c., were employed and projected both for defence and offence, but they were projected or blown by engines and not by themselves. It is quite inconceivable that a real propelling explosive should have been known in the time of Alexander or much later, and not have immediately taken its proper place. In a chapter discussing this question of explosives amongst the Hindus, Hime says: "It is needless to enlarge the list of quotations; incendiaries pursued much the same course in Upper India as in Greece and Arabia." No trustworthy evidence of an explosive in India is to be found until the 21st of April 1526, the date of the decisive battle of Panipat, in which Ibrahim, sultan of Delhi, was killed and his army routed by Baber the Mogul, who possessed great and small fire-arms. As regards also the crusader period (1097-1291), so strange and deadly an agent of destruction as gunpowder could not possibly have been employed in the field without the full knowledge of both parties, yet no historian, Christian or Moslem, alludes to an explosive of any kind, while all of them carefully record the use of incendiaries. The employment of rockets and "wildfire" incendiary composition seems undoubtedly of very old date in India, but the names given to pieces of artillery under the Mogul conqueror of Hindustan point to a European, are at least to a Turkish origin, and it is quite certain that Europeans were retained in the service of Akbar and Aurangzeb. The composition of present day Chinese gunpowder is almost identical with that employed in Europe, so that in all probability the knowledge of it was obtained from Western sources. In the writings of Bacon there is no mention of guns or the use of powder as a propellant, but merely as an explosive and destructive power. Owing perhaps to this obscurity hanging over the early history of gunpowder, its employment as a propelling agent has been ascribed to the Moors or Saracens. J. A. Conde (Historia del la dominacion de los Arabes en España) states that Ismail Ben Firaz, king of Granada, who in 1325 besieged Boza, had among his machines "some that cast globes of fire," but there is not the least evidence that these were guns. The first trustworthy document relative to the use of gunpowder in Europe, a document still in existence, and bearing date February 11, 1326, gives authority to the council of twelve of Florence and others to appoint persons to superintend the manufacture of cannons of brass and iron balls, for the defence of the territory, &c., of the republic. John Barbour, arch-deacon of Aberdeen, writing in 1375, states that cannons (crakys of war) were employed in Edward III. 's invasion of Scotland in 1327. An indenture first published by Sir N. H. Nicolas in his History of the Royal Navy (London, 1846), and again by Lieutenant-Colonel H. Brackenbury (Proc. R. A. Inst., 1865), stated to be 1338, contains references to small cannon as among the stores of the Tower, and also mentions "un petit barrell de gonpoudre le quart' plein." If authentic, this is possibly the first mention of gunpowder as such in England, but some doubts have been thrown upon the date of this MS. From a contemporary document in the National Library in Paris it seems that in the same year (1338) there existed in the marine arsenal at Rouen an iron weapon called pot de feu, for propelling bolts, together with some saltpetre and sulphur to make powder for the same. Preserved in the Record Office in London are trustworthy accounts from the year 1345 of the purchase of ingredients for making powder, and of the shipping of cannon to France. In 1346 Edward III. appears to have ordered all available saltpetre and sulphur to be brought up for him. In the first year of Richard II. (1377) Thomas Norbury was ordered to buy, amongst other munitions, sulphur, saltpetre and charcoal, to be sent to the castle of Brest. In 1414 Henry V. ordered that no gunpowder should be taken out of the kingdom without special licence, and in the same year ordered twenty pipes of willow charcoal and other articles for the use of the guns. The manufacture of gunpowder seems to have been carried on as a crown monopoly about the time of Elizabeth, and regulations respecting gunpowder and nitre were made about 1623 (James I.). Powder-mills were probably in existence at Waltham Abbey about the middle or towards the end of the 16th century. Ingredients and their Action.—Roger Bacon in his anagram gives the first real recipe for gunpowder, viz. (according to Hime, ch. xii.) saltpetre 41.2, charcoal 29.4, sulphur 29.4. Dr John Arderne of Newark, who began to practise about 1350 and was later surgeon to Henry IV., gives a recipe (Sloane MSS. 335, 795), saltpetre 66.6, charcoal 22.2, sulphur 11.1, "which are to be thoroughly mixed on a marble and then sifted through a cloth." This powder is nominally of the same composition as one given in a MS. of Marcus Graecus, but the saltpetre of this formula by Marcus Graecus was undoubtedly answerable for the difference in behaviour of the two compositions. Roger Bacon had not only refined and obtained pure nitre, but had appreciated the importance of thoroughly mixing the components of the powder. Most if not all the early powder was a "loose" mixture of the three ingredients, and the most important step in connexion with the development of gunpowder was undoubtedly the introduction of wet mixing or "incorporating." Whenever this was done, the improvement in the product must have been immediately evident. In the damp or wetted state pressure could be applied with comparative safety during the mixing. The loose powder mixture came to be called "serpentine"; after wet mixing it was more or less granulated or corned and was known as "corned" powder. Corned powder seems to have been gradually introduced. It is mentioned in the Fire Book of Conrad von Schöngau (in 1429), and was used for hand-guns in England long before 1560. It would seem that corned powder was used for hand-guns or small arms in the 15th century, but cannon were not made strong enough to withstand its explosion for quite another century (Hime). According to the same writer, in the period 1250-1450, when serpentine only was used, one powder could differ from another in the proportions of the ingredients; in the modern period—say 1700-1886—the powders in use (in each state) differed only as a general rule in the size of the grain, whilst during the transition period—1450-1700—they generally differed both in composition and size of grain. Corned or grained powder was adopted in France in 1525, and in 1540 the French utilized an observation that large-grained powder was the best for cannon, and restricted the manufacture to three sizes of grain or corn, possibly of the same composition. Early in the 18th century two or three sizes of grain and powder of one composition appear to have become common. The composition of English powder seems to have settled down to 75 nitre, 15 charcoal, and 10 sulphur, somewhere about the middle of the 18th century. 1250. 1350. 1560. 1647. 1670. 1742. 1781. France. Sweden. Germany. Denmark. France. Sweden. Germany. 1338. 1560. 1595. 1608. 1650. 1697. 1882. When reasonably pure, none of the ingredients of gunpowder absorbs any material quantity of moisture from the atmosphere, and the nitre only is a soluble substance. It seems extremely probable that for a long period the three substances were simply mixed dry, indeed sometimes kept separate and mixed just before being required; the consequence must have been that, with every care as to weighing out, the proportions of any given quantity would alter on carriage. Saltpetre is considerably heavier that sulphur or charcoal, and would tend to separate out towards the bottom of the containing vessel if subjected to jolting or vibration. When pure there can only be one kind of saltpetre or sulphur, because they are chemical individuals, but charcoal is not. Its composition, rate of burning, &c., depend not only on the nature of the woody material from which it is made, but quite as much on the temperature and time of heating employed in the making. The woods from which it is made contain carbon, hydrogen and oxygen, and the two latter are never thoroughly expelled in charcoal-making. If they were the resulting substance would be of no use for gunpowder. 1-3% of hydrogen and 8-15% of oxygen generally remain in charcoals suitable for gunpowder. A good deal of the fieriness and violence of explosion of a gunpowder depends on the mode of burning of the charcoal as well as on the wood from which it is made. Properties of Ingredients.—Charcoal is the chief combustible in powder. It must burn freely, leaving as little ash or residue as possible; it must be friable, and grind into a non-gritty powder. The sources from which powder charcoal is made are dogwood (Rhamnus frangula), willow (Salix alba), and alder (Betula alnus). Dogwood is mainly used for small-arm powders. Powders made from dogwood charcoal burn more rapidly than those from willow, &c. The wood after cutting is stripped of bark and allowed to season for two or three years. It is then picked to uniform size and charred in cylindrical iron cases or slips, which can be introduced into slightly larger cylinders set in a furnace. The slips are provided with openings for the escape of gases. The rate of heating as well as the absolute temperature attained have an effect on the product, a slow rate of heating yielding more charcoal, and a high temperature reducing the hydrogen and oxygen in the final product. When heated for seven hours to about 800° C. to 900° C the remaining hydrogen and oxygen amount to about 2% and 12% respectively. The time of charring is as a rule from 5 to 7 hours. The slips are then removed from the furnace and placed in a larger iron vessel, where they are kept comparatively air-tight until quite cold. The charcoal is then sorted and stored for some time before grinding. The charcoal is ground, and the powder sifted on a rotating reel or cylinder of fine mesh copper-wire gauze. The sifted powder is again stored for some time before use in closed iron vessels. Sicilian sulphur is most generally employed for gunpowder, and for complete purification is first distilled and then melted and cast into moulds. It is afterwards ground into a fine powder and sifted as in the case of the charcoal. Potassium nitrate is eminently suitable as an oxygen provider, not being deliquescent. Nitrates are continually being produced in surface soils, &c., by the oxidation of nitrogenous substances. Nitric and nitrous acids are also produced by electric discharges through the atmosphere, and these are found eventually as nitrates in soils, &c. Nitre is soluble in water, and much more so in hot than in cold. Crude nitre, obtained from soils or other sources, is purified by recrystallization. The crude material is dissolved almost to saturation in boiling water: on filtering and then cooling this liquor to about 30° C. almost pure nitre crystallized out, most of the usual impurities still remaining in solution. By rapidly cooling and agitating the nitre solution crystals are obtained of sufficient fineness for the manufacture of powder without special grinding. Nitre contains nearly 48% of oxygen by weight, five-sixths of which is available for combustion purposes. Nearly all the gases of the powder explosion are derived from the nitre. The specific gravity of nitre is 2.2: 200 grams will therefore occupy about 100 cubic centimetres volume. This quantity on its decomposition by heat alone yields 28 grams or 22,400 c.c. of nitrogen, and 80 grams or 56,000 c.c of oxygen as gases and 94 grams of potassium oxide, a fusible solid which vaporizes at a very high temperature. Incorporation.—The materials are weighed out separately, mixed by passing through a sieve, and then uniformly moistened with a certain quantity of water, whilst on the bed of the incorporating mill. This consists of two heavy iron wheels mounted so as to run in a circular bed. The incorporation requires about four hours. The mechanical action of rollers on the powder paste is a double one: not only crushing but mixing by pushing forwards and twisting sideways. The pasty mass is deflected so that it repeatedly comes under first one roller and then the next by scrapers, set at an angle to the bed, which follow each wheel. Although the charge is wet it is possible for it to be fired either by the heat developed by the roller friction, by stone, &c., or possibly by heat generated by oxidation of the materials. The mills are provided with a drenching apparatus so arranged that in case of one mill firing it and its neighbours will be drowned by water from a cistern or tank immediately above the mill. The product from the incorporation is termed "mill-cake." After this incorporation in the damp stare the ingredients never completely separate on drying, however much shaken, because each particle of nitre is surrounded by a thin layer of water containing nitre in solution in which the particles of charcoal and sulphur are entangled and retained. After due incorporation, powders are pressed to a certain extend whilst still moist. The density to which a powder is pressed is an important matter in regard to the rate of burning. The effect of high density is to slow down the initial rate of burning. Less dense powders burn more rapidly from the first and tend to put a great strain on the gun. Fouling is usually less with denser powders; and, as would be expected, such powders bear transport better and give less dust than light powders. Up to a certain pressure, hardness, density, and size of grain of a powder have an effect on the rate of burning and therefore on pressure. Glazing or polishing powder grains, also exerts a slight retarding action on burning and enables the powders to resist atmospheric moisture better. Excess of moisture in gunpowder has a marked effect in reducing the explosiveness. All powders are liable to absorb moisture, the quality and kind of charcoal being the main determinant in this respect; hard burnt black charcoal is least absorbent. The material employed in brown powders absorbs moisture somewhat readily. Powder kept in a very damp atmosphere, and especially in a changeable one, spoils rapidly, the saltpetre coming to the surface in solution and then crystallizing out. The pieces also break up owing to the formation of large crystals of nitre in the mass. After the pressing of the incorporated powder into a "press-cake," it is broken up or granulated by suitable machines, and the resulting grains separated and sorted by sifting through sieves of determined sizes of mesh. Some dust is formed in this operation, which is sifted away and again worked up under the rollers (for sizes of grains see fig. 1). These grains, cubes, &c., are then either polished by rotating in drums alone or with graphite, which adheres to and coats the surface of the grains. This process is generally followed with powders intended for small-arms or moderately small ordnance. Shaped Powders.—Prisms or prismatic powder are made by breaking up the press-cake into a moderately fine state, whilst still moist, and pressing a certain quantity in a mould. The moulds generally employed consist of a thick plate of bronze in which are a number of hexagonal perforations. Accurately fitting plungers are so applied to these that one can enter at the top and the other at the bottom. The lower plunger being withdrawn to the bottom of the plate the hexagonal hole is charged with the powder and the two plungers set in motion, thus compressing the powder between them. After the desired pressure has been applied the top plunger is withdrawn, and the lower one pushed upward to eject the prism of powder. The axial perforations in prism powders are made by small bronze rods which pass through the lower plunger and fit into corresponding holes in the upper one. If these prisms are made by a steadily applied pressure a density throughout of about 1.78 may be obtained. Further to regulate the rate of burning so that i shall be slow at first and more rapid as the powder is consumed, another form of machine was devised, the cam press, in which the pressure is applied very rapidly to the powder. It receives in fact one blow, which compresses the powder to the same dimensions, but the density of the outer layers of substance of the prism is much greater than in the interior. The leading idea in connexion with all shaped powder grains, and with the very large sized, was to regulate the rate of burning so as to avoid extreme pressure when first ignited and to keep up the pressure in the gun as more space was provided in the chamber or tube by the movement of the shot towards the muzzle. In the perforated prismatic powders the ignition is intended to proceed through the perforations; since in a charge the faces of the prisms fit pretty closely together, it was thought that this arrangement would prevent unburnt cores or pieces of powder from being blown out. These larger grain powders necessitated a lengthened bore to take advantage of the slower production of gases and complete combustion of the powder. General T. J. Rodman first suggested and employed the perforated cake cartridge in 1860, the cake having nearly the diameter of the bore and a thickness of 1 to 2 in. with perforations running parallel with the gun axis. The burning would then start from the comparatively small surfaces of the perforations, which would become larger as the powder burnt away. Experiments bore out this theory perfectly. It was found that small prisms were more convenient to make than large disks, and as the prisms practically fit together into a disk the same result was obtained. This effect of mechanical density on rate of burning is good only up to a certain pressure, above which the gases are driven through the densest form of granular material. After granulating or pressing into shapes, all powders must be dried. This is done by heating in specially ventilated rooms heated by steam pipes. As a rule this drying is followed by the finishing or polishing process. Powders are finally blended i.e. products from different batches or "makes" are mixed so that identical proof results are obtained. Sizes and Shapes of Powders.—In fig. 1, a to k show the relative sizes and shapes of grain as formerly employed for military purposes, except that the three largest powders, e-f-f and h are figured half-size to save space; whereas the remainder indicate the actual dimensions of the grains. a is for small-arms, all the others are for cannon of various sizes. 1. For colour, glaze, texture and freedom from dust. 3. For shape, size and proportion of the grains.—The first is judged by eye, and grains of the size required are obtained by the use of sieves of different sizes. 4. Density.—The density is generally obtained in some form of mercury densimeter, the powder being weighed in air and then under mercury. In some forms of the instrument the air can be pumped out so that the weighting takes place in vacuo. 5. Moisture and absorption of moisture.—The moisture and hygroscopic test consists in weighing a sample, drying at 100° C. for a certain time, weighing again, &c., until constant. The dried and weighed sample can then be exposed to an artificial atmosphere of known moisture and temperature, and the gain in weight per hour similarly ascertained by periodic weighings. 6. Firing proof.—The nature of this depends upon the purpose for which the powder is intended. For sporting powders it consists in the "pattern" given by the shot upon a target at a given distance, or, if fired with a bullet, upon the "figure of merit," or mean radial deviation of a certain number of rounds; also upon the penetrative power. For military purposes the "muzzle" velocity produced by a powder is ascertained by a chronograph which measures the exact time the bullet or other projectile takes to traverse a known distance between two wire screens. By means of "crusher gauges" the exact pressure per square inch upon certain points in the interior of the bore can be found. In the chemical examination of gunpowder the points to be ascertained are, in addition to moisture, freedom from chlorides or sulphates, and correct proportion of nitre and sulphur to charcoal. Products of Fired Powder and Changes taking place on Explosion.—With a mixture of the complexity of gunpowder it is quite impossible to say beforehand what will be the relative amounts of products. The desired products are nitrogen and carbon dioxide as gases and potassium sulphate and carbonate as solids. But the ingredients of the mixture are not in any simple chemical proportion. Burning in contact with air under one atmosphere pressure, and burning in a closed or partially closed vessel under a considerable number of atmospheres pressure, may produce quite different results. The temperature of a reaction always rises with increased pressure. Although the main function of the nitre is to give up oxygen and nitrogen, of the charcoal to produce carbon dioxide and most of the heat, and of the sulphur by vaporizing to accelerate the rate of burning, it is quite impossible to represent the actions taking place on explosion by any simple or single chemical equation. Roughly speaking, the gases from black powder burnt in a closed vessel have a volume at 0° C. and 760 mm. pressure of about 280 times that of the original powder. The temperature produced under one atmosphere is above 2000° C., and under greater pressures considerably higher. From this, and other results, Debus concluded that Waltham Abbey powder should be represented by the formula 16KNO3+21.18C+6.63S and that on combustion in a closed vessel the end results could be fairly expressed (rounding off fractions) by 16KNO3+21C+5S=5K2CO3+K2SO4+2K2S2+13CO2+3CO+8N2. Some of the sulphur is lost, part combining with the metal of the apparatus and part with hydrogen in the charcoal. The military powders of most nations can be represented by the formula 16KNO3+21.2C+6.6S, proportions which are reasonably near to a theoretical mixture, that is one giving most complete combustion, greatest gas volume and temperature. The combustion of powder consists of two processes: (i.) oxidation, during which potassium carbonate and sulphate, carbon dioxide and nitrogen are mainly formed, and (ii.) a reduction process in which free carbon acts on the potassium sulphate and free sulphur on the potassium carbonate, producing potassium sulphide and carbon monoxide respectively. Most powders contain more carbon and sulphur than necessary, hence the second stage. In this second stage heat is lost. The potassium sulphide is also the most objectionable constituent as regards fouling. The energy of a powder is given, according to Berthelot, by multiplying the gas volume by the heat (in calories) produced during burning; Debus shows that a powder composed of 16KNO3 to 8C and 8S would have the least, and one of composition 16KNO3+24C+16S the greatest, when completely burnt. The greatest capability with the lowest proportion of carbon and sulphur to nitre would be obtained from the mixture 16KNO3+22C+8S. 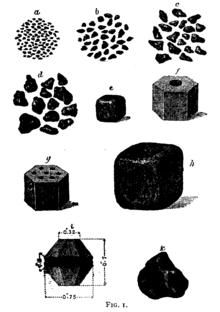 Brown Powders.—About the middle of the 19th century guns and projectiles were made much larger and heavier than previously, and it was soon found that the ordinary black powders of the most dense form burnt much too rapidly, straining or bursting the pieces. Powders were introduced containing about 3% sulphur and 17-19% of a special form of charcoal made from slightly charred straw, or similar material. This "brown charcoal" contains a considerable amount of the hydrogen and oxygen of the original plant substance. The mechanical processes of manufacture of these brown powders is the same as for black. They, however differ from black by burning very slowly, even under considerable pressure. This comparative slowness is caused by (1) the presence of a small amount of water even when air-dry; (2) the fact that the brown charcoal is practically very slightly altered cellulosic material, which before it can burn completely must undergo a little further resolution or charring at the expense of some heat from the portion of charge first ignited; and (3) the lower content of sulphur. An increase of a few per cent in the sulphur of black powder accelerates its rate of burning, and it may become almost a blasting powder. A decrease in sulphur has the reverse effect. It is really the sulphur vapour that in the early period of combustion spreads the flame through the charge. Many other powders have been made or proposed in which nitrates or chlorates of the alkalis or of barium, &c., are the oxygen providers and substances as sugar, starch, and many other organic compounds as the combustible elements. Some of these compositions have found employment for blasting or even as sporting powders, but in most cases their objectionable properties of fouling, smoke and mode of exploding have prevented their use for military purposes. The adoption by the French government of the comparatively smokeless nitrocellulose explosive of Paul Vielle in 1887 practically put an end to the old forms of gunpowders. The first smokeless powder was made in 1865 by Colonel E. Schultze (Ding. Pol. Jour. 174, p. 323; 175, p.453) by nitrating wood meal and adding potassium and barium nitrates. It is somewhat similar in composition to the E. C. sporting powder. F. Uchatius, in Austria, proposed a smokeless powder made from nitrated starch, but it was not adopted owing to its hygroscopic nature and also its tendency to detonate. Notes on Gunpowder and Gun Cotton, published by order of the secretary of state for war (London, 1907). ↑ These words were emended by some authors to read luru mope can ubre, the letters of which can be arranged to give pulvere carbonum. ↑ This represents the composition of English powder at present and no doubt it has remained the same for a longer time than the above date indicates. ↑ Brown or coco-powder for large charges in guns. The charcoal is not burnt black but roasted until brown, and is made from some variety of straw, not wood. This page was last edited on 24 December 2012, at 13:03.